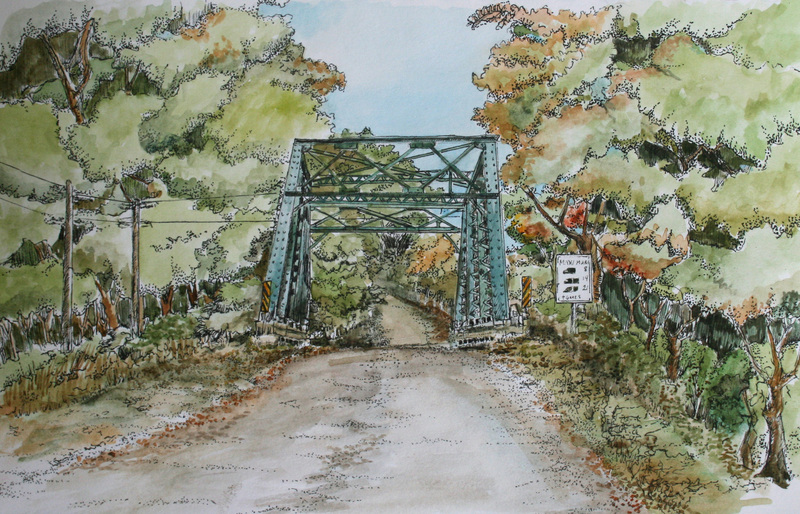 The bridge on Brouwers Line is located just outside the Archie Coulter Conservation Area. 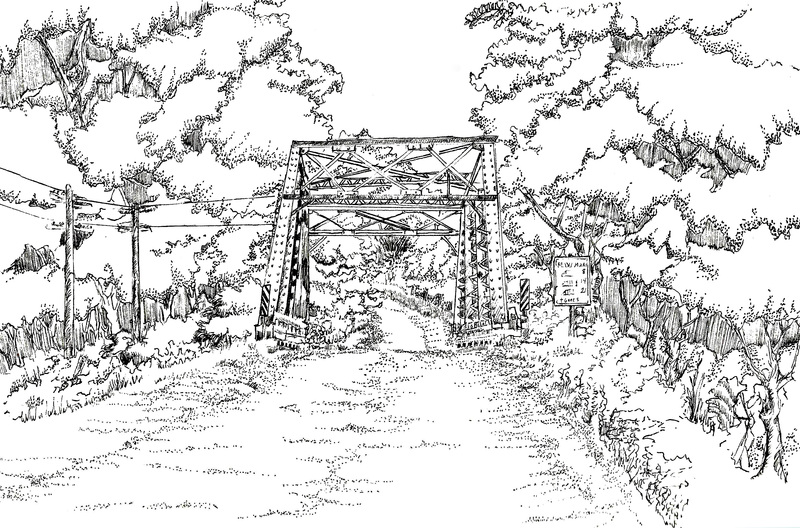 The conservation area stretches for 133 acres along the west branch of Catfish Creek. This piece is based on a photograph I took whilst visiting the site a couple of years ago. 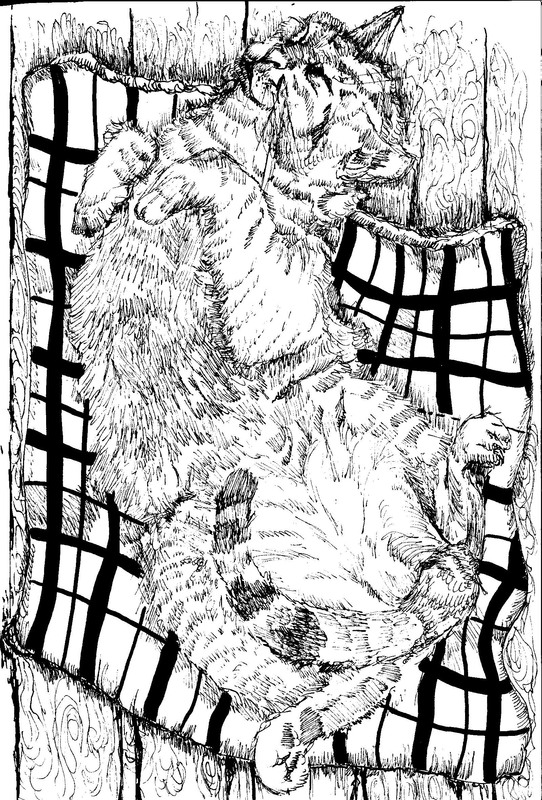 The first scan is the work in progress as a pigment pen drawing. 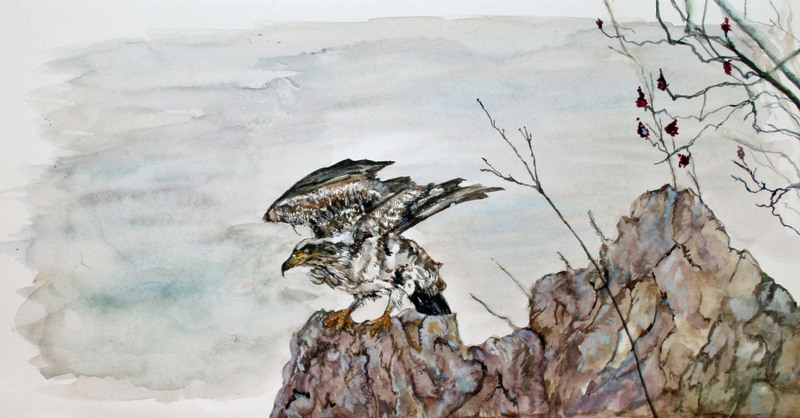 The second is the piece finished with water colour. 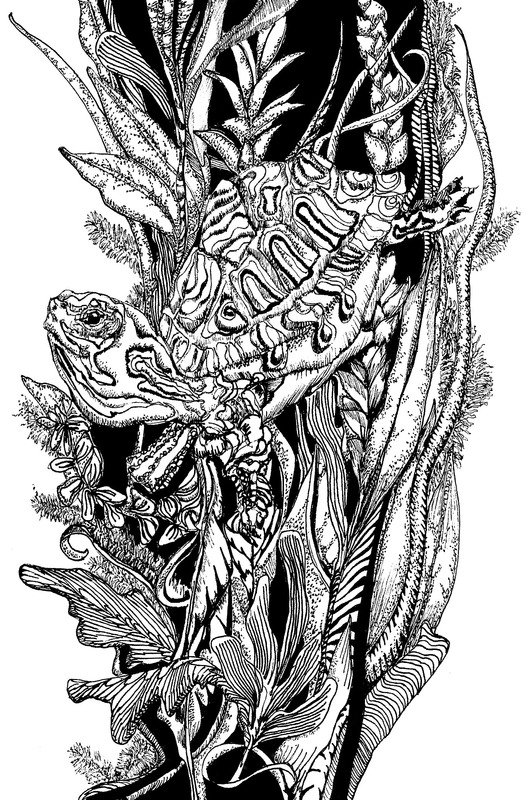 This piece started with a drawing based on a turtle photo I found online. The turtle felt a little lonely sitting all by itself in the middle of the white page so I placed it “under water”. The plants aren’t referenced from anywhere other than vague memories of water plants I’ve seen prior. I utilized a compact composition to create a natural frame whilst allowing some of the drawing to break that framing element. It’s a characteristic I associate with movement and I like the organic atmosphere it engenders. This watercolour sketch is based on a photograph I took a couple of summers ago. An enormous toad would come out after dark and sit on the back patio. He was a bit of a stoic chunky bumpy blob who couldn’t be bothered to move even as I took a couple of flash photos. I started the sketch by keeping a light hand layering in the background and basic shape. When those sections were dry I added a bit more character using the accent of darker markings. The lighthouse on Pelee Island was originally built in 1833 and then restored in 2000. 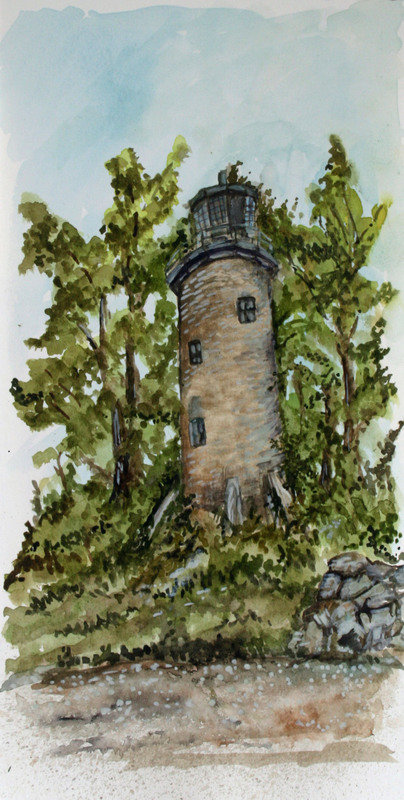 I based this watercolour sketch on a photo I took of the lighthouse when I was hiking on the island* in the summer of 2009. The lighthouse is bordered on three sides by water. I remember walking up the shoreline to see the lighthouse rising through the summer greenery. It looked like something from a fairy tale. That memory came into play as I worked on this piece leading me to use organic shapes and lines along with softer edges in an attempt to capture a sort of whimsical storybook feel. *The lighthouse is located in the Lighthouse Point Provincial Nature Reserve which is a non-operating park. There aren’t any facilities but it is open to the public for hiking, swimming, birdwatching, photography…etc. 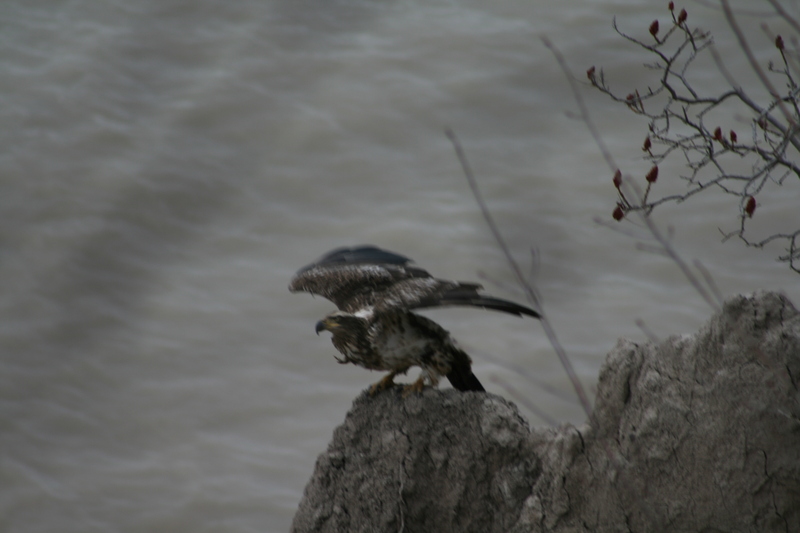 I captured an image of an immature bald eagle way back in February 2006. I was heading down to the lake and stopped to look over the cliffside to see how rough the water was. I was surprised to see the eagle sitting there. The picture ended up blurry as I only had a split second before the raptor saw me and took off. The photograph wasn’t good enough to use anywhere but it was interesting enough to keep for resource material. For this project I created contrast by layering watercolour washes and allowing them to dry before working darker linear elements on top. The original image was very grey. I thought it might look muddy rendered in watercolour so I opted for a brighter palette. Acrylic was used for the white highlights. 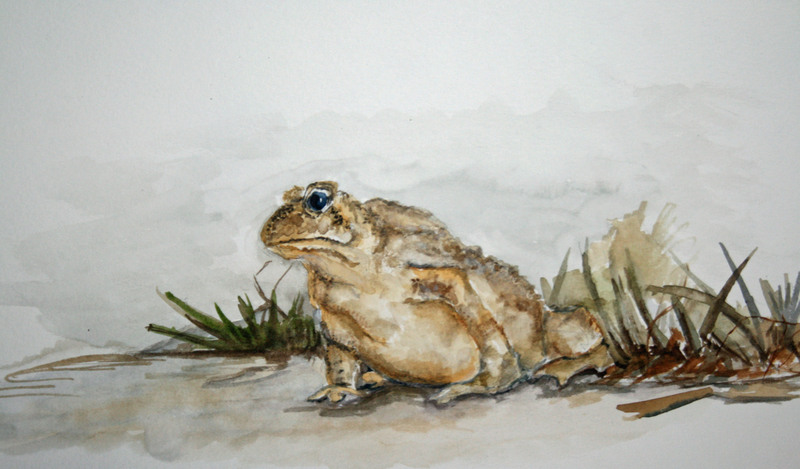 If you compare it to the original image (bottom of post) you can see my watercolour sketch isn’t a faithful rendering. That wasn’t really what I was about here. 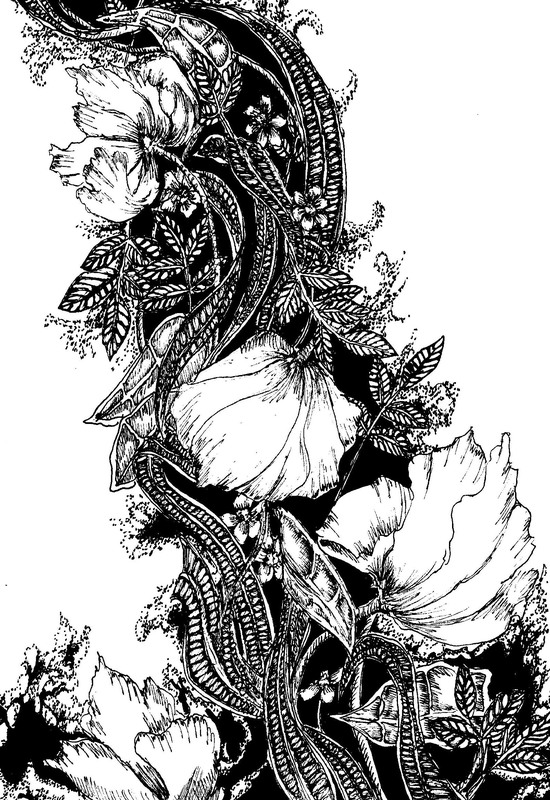 I primarily wanted to explore how this would work with watercolours in a small scale. I’ve included this picture to better show the size of the piece. 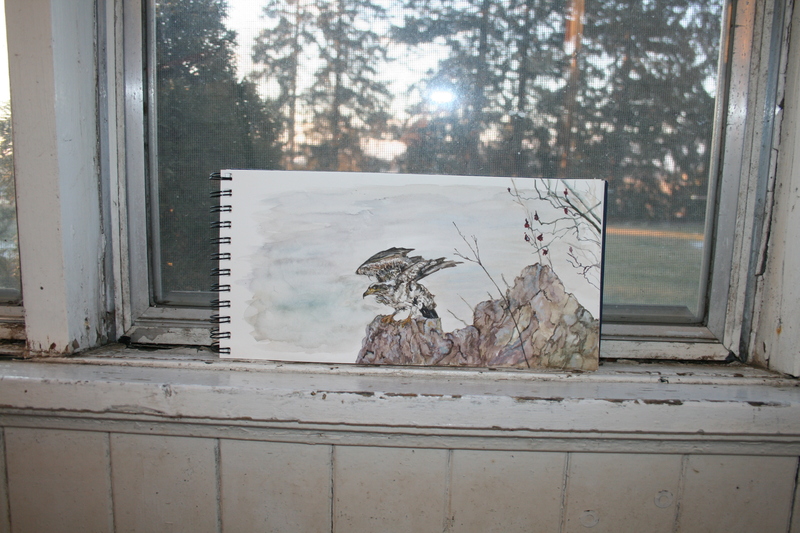 I photographed my sketchbook in the mudroom off the back of the house to make use of the afternoon light. I wish it was as warm as this picture makes it look. It was super chilly! Although an interesting experiment, I’m not sure watercolour was the most effective medium for this particular composition. I’m not saying I’m unhappy with the results. I learned a lot and if I return to this image as a resource I’ll have a better understanding of how to work with it. The Inktober prompts for these were “Whale” and “Flowing”. The vagueness of the terms allowed for any kind of interpretation. I utilised different marking techniques for each of these images but the designs follow a similar footprint. The eye is drawn from the upper left corner into the page and down for both. 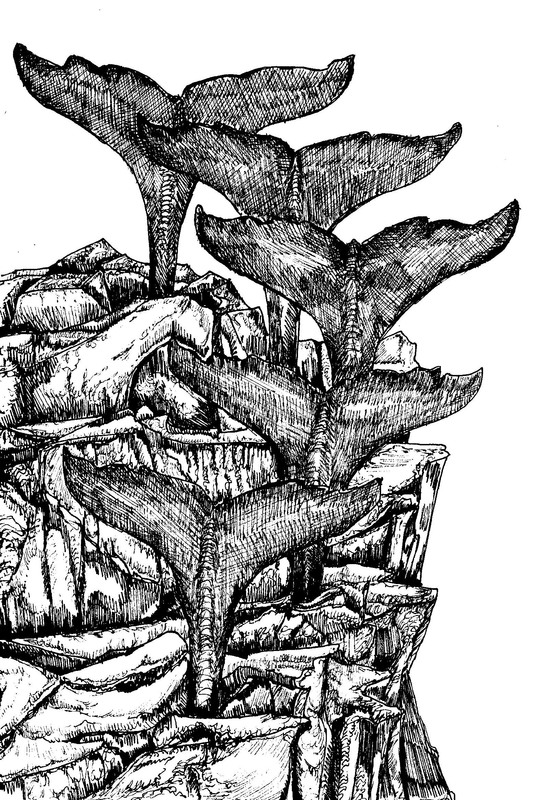 The downward movement is emphasised through the descending verticals of the “whale tails” in the upper drawing. For the lower drawing the downward movement is created through the use of elongated “ribbons” that serve to direct the gaze. Even though the imagery and marks chosen are different they find a common ground in the compositional movement. 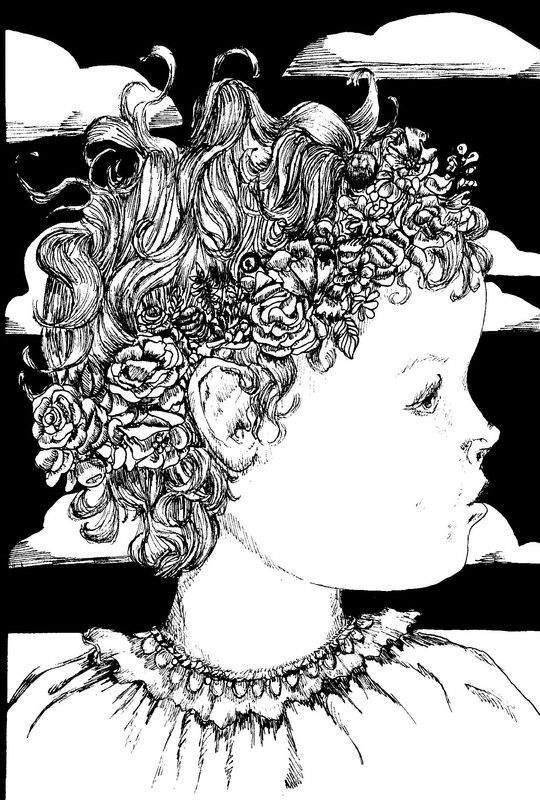 When I was growing up I read a multitude of children’s and young adult books with great illustrations. I continue to find something very appealing about that particular combination of story and imagery. 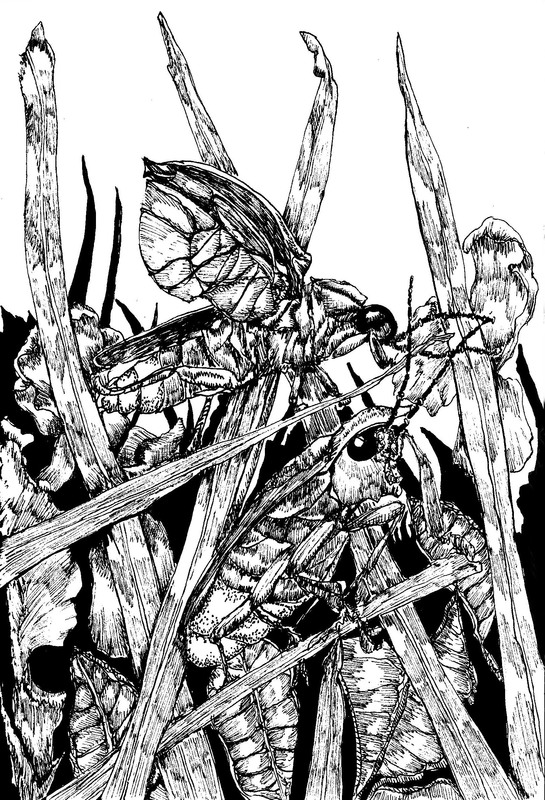 One of the things I’ve enjoyed about interpreting the suggested themes for Inktober is how illustrative the finished drawings feel to me. Though they don’t exist in the context of a story I can see them as such. It wasn’t a conscious decision on my part. I only noticed it in hindsight. I suppose everything we do is influenced (in ways too numerous to count or even clearly remember) by all that we’ve been exposed to.